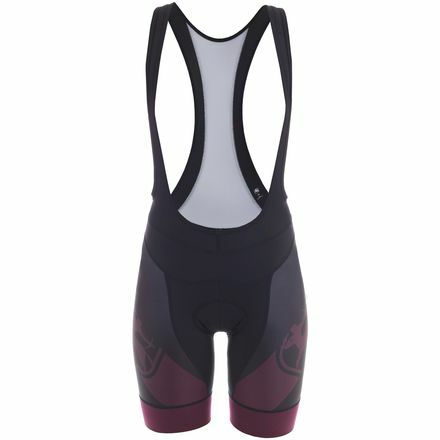 Giordana claims that the FormaRed Carbon Women's Bib Shorts are the "pinnacle of women's bib short technology," and while we haven't undertaken a truly exhaustive survey of the marketplace, it's easy to see why Giordana thinks the FormaRed Carbon is unbeatable. FormaRed is Giordana's top-shelf line, designed with an aerodynamic body-hugging fit that's perfect for racing and training, when seconds count or power is at a premium. To get that race-ready fit and feel, Giordana engineered the FormaRed with HC50 high-compression Lycra on the front and side panels, which support your muscles to prevent vibration and reduce wasted energy. HC50 also has a soft and supple touch for unbeatable comfort and a "barely there" feel. On the inner leg, Giordana uses Zaffiro 2. 0, a textured fabric that provides a tough layer between your skin and the saddle to prevent discomfort. The hems incorporate 190E soft silicone bands for a snug seal that won't ride up, pinch, or restrict movement. The bibs themselves are extremely lightweight and breathable, with a minimal design that increases breathability, decreases weight, and enhances comfort. 190 mesh and LoPro 0 combine to create soft, supportive straps, while a carbon-infused Ametista Core Contour band wraps around the waist for support. Giordana cut the FormaRed using its Women Contour Fit System, which is designed to fit best in the riding position, since that's where you'll be spending most of your time. Finally, the FormaRed uses a Cirro O. F. chamois, the most advanced pad in Giordana's collection. It uses variable-thickness padding that's cut to fit your contours, and has aloe vera integrated into the fibers to help heal and cool your skin, even while you're in the saddle. It's also designed to wick moisture and breathe well, so it stays dry, and is slightly stretchy to better conform to your anatomy.